An article about Freemasonry in New South Wales, Australia appeared Tuesday on the ABC website highlighting their recent increases in new members between 18-30. The article says that some local lodges are seeing recent gains among younger men as high as 10-15% over previous years. Freemason Alec Ayling, in South Australia's Riverland, said it had been daunting attending his first meeting. "If you were to join, you were blindfolded before you came in and you're conducted around certain areas and had things explained, and then you're sort of brought to light," he said. 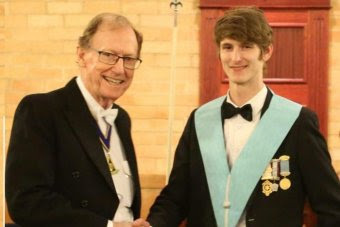 In the Grand Lodge of South Australia and the Northern Territory, 75 per cent of its 115 new members over the past year were in the 20–30-year-old age bracket. Port Adelaide Freemason Cooper Andrew Allan, 22, said young people were finding a sense of purpose with the group. "Inside that lodge room there's no phone, there's no iPad. It's very much like an enlightenment society. It's a time for peace, tranquillity and learning." Freemason Ryan Mann was 32 when he joined and feels since then he has become a better person and found a sense of brotherhood. "There was this vibe, a warm feeling in the [lodge] room, a feeling I hadn't felt in long time. There was just a bunch of good men in the room," he said. "With a tried and tested system, [it was about] making a good man better." Mr Mann admitted his initial contact with Freemasonry had involved looking at conspiracy videos on the internet. It is good to hear of young men joining the Craft in Australia. I hope the trend is highly contagious! NSW Australia also borders the state territory of Victoria, Australia, which is sometimes referred to as the 'education state'. Victoria is also a center of Masonic activity thanks to professional educator and Australian Mason, Kent Henderson. Brother Henderson's book entitled, "Masonic World Guide" is still available in print and much of the information is still relevant today. I used it in the 90's during Masonic travels to South Korea, Japan, and the Philippines. The book has been expanded into two volumes since the first publication in 1985 and all three are available on Amazon. Of course, any Mason considering international Masonic travel should always first clear it with their respective Grand Secretary.